Rogue One is ambitious, and succeeds as a coherent work despite its many rewrites and reshoots. It gives the Galactic Civil War the kind of political context the Clone Wars had, making it an essential piece connecting the prequel and original trilogies. Visually, too, Gareth Edwards seamlessly meshes the two styles: the Battle of Scarif’s starships have the plasticky solidity of the models from A New Hope, but the dynamism of Revenge of the Sith’s Battle of Coruscant. No Star Wars film has looked better, partly because, like Lucas, Edwards knows when to keep his camera still, letting the frame to do the work and creating a sense of depth and scale. There’s also an extraordinary level of detail to the production: Jedha feels like a living, breathing, complex culture. Edwards also understands that action scenes are more exciting when the camera isn’t darting and spinning frantically in all directions, and you can actually see what’s going on. Both are lessons many modern blockbuster directors, JJ Abrams among them, would do well to learn. Rogue One also charts new ground by digging into the dirtier aspects of warfare, generally skipped over in the fairy-tale/serial-adventure Saga. The Last Jedi was predicted to bring more “grey”, but it’s very traditional: DJ’s argument that there are “no good guys or bad guys” holds no weight because he’s such an unscrupulous traitor, and there’s really no question that the First Order are Bad and the Resistance are Good. Rogue One has Saw Gerrera’s extremism, Jyn’s apathy, Draven’s callousness, the cowardice of the Alliance Council, Galen’s “collaboration”, and Cassian is introduced shooting an unarmed man in the back. Yet it maintains its Star Wars spirit – heroes rise above the dirt through the magic of hope and sacrifice, helped by heartfelt and complex performances by Felicity Jones and Diego Luna. It is a true Star Wars epic, perfectly balancing original and prequel sensibilities while exploring new territory and new filmmaking technology. It’s easy to see why Lucas liked it so much. Solo, meanwhile, is the Star Warsiest of the new films. Ron Howard, an old friend of Lucas, is of a different generation than the other directors. The Force Awakens and TLJ are films about Star Wars, made by people who grew up with it and whose primary reference points are Star Wars itself, and following characters who themselves are responding to the legacy of the original trilogy. TFA tries to recapture the spirit of the original, and occasionally succeeds due to its stellar cast, but is hamstrung by a directorial style that somehow feels too kinetic and modern. Rian Johnson draws on older and wider references than Abrams, but his Star Wars is still a post-Dark Knight, post-Skyfall subversive blockbuster, deconstructing and rebuilding its icons. Howard is actually making a Star Wars movie, and his reference points are genres Lucas played around in: the western, film noir, the classic Hollywood romantic melodrama. Howard understands that Star Wars works when it feels old-fashioned, hearkening back to the days of swashbuckling serial adventures and old Hollywood. His directorial style, his framing of shots and pacing, are the most Lucas-like of all the new directors. The performances reflect this, particularly Alden Ehrenreich, who wouldn’t feel out of place in the 1930s or 40s. 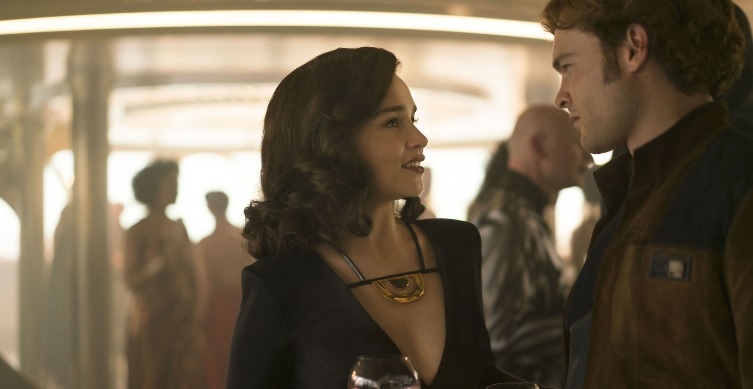 Emilia Clarke’s Qi’ra is a femme fatale, but more complicated than the cliché and given a stronger ending than, for example, the eponymous Gilda. John Powell’s love theme is a sweeping Hollywood classic that easily stands alongside Across the Stars, but also made me think of Bernard Herrmann’s work on Vertigo. 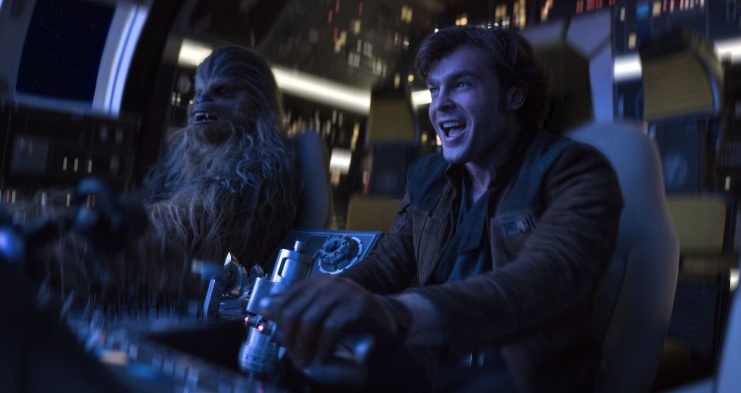 And the Kessel Run is the most fun I have had watching any of the recent films: no sequence has come closer to capturing the sheer adventurous fun of A New Hope since 1977. Where TLJ, with lines like “I wish I could put my fist through this whole lousy beautiful town,” winks at the old movies (and simultaneously winks at us), Howard is actually making an old movie. Solo has the most coherent script, with the clearest central arc of the new films (its production problems being unrelated to the screenplay, unlike Rogue One). It’s the most fun, understanding that it can be silly without winking too heavily at its audience, lest the spell be broken. It feels the most Star Wars, and to complete my blasphemy, it has the best soundtrack, too. On a recent trip I watched it on the outbound flight, and again on the return, and then again on blu-ray when I got home, and it was an increasing delight each time. It’s the Disney film I’ll go back to most often, but Rogue One won’t be far behind. One of the biggest ironies of the new films is that where we might have expected the Saga films to be the “epics,” they have taken place over the space of a week in a tiny, unfamiliar corner of the galaxy. The anthologies have spanned that galaxy, unafraid of saying “this is the same place as the original trilogy and the prequels and the TV shows.” Coruscant, Mustafar, Corellia, Kessel, Twi’leks, Pykes, Darth Maul. This shouldn’t be dismissed as nostalgia or “fanservice” – there’s a difference between putting something in simply for the nostalgic rush, and making the movie feel like it’s part of the same universe. When Finn turns on the holochess board in TFA, it’s so the cast can stand around silently for five seconds while the audience point and whisper “I remember that!”; in Solo, it’s used so Beckett can teach Han and Chewie a lesson that will come back to haunt him in the finale. While the sequel trilogy, like its characters, navigates toward finding an identity, working out how best to deal with the weight of the past, the anthology movies have been free to have a bit more fun. The Saga comes with certain structural expectations thanks to Lucas’s “rhyming” approach, and there’s a delicate balance to be struck between how much of this structure to follow, and how much to subvert. The anthologies came with no such expectations, and Rogue One and Solo have been frolicking in Lucas’s sandbox – building on his world, exploring new corners, while honoring his style and keeping alive the old Star Wars spirit. It is a tragedy that we might not see another anthology movie for some time, but there’s cause to believe that not only can their spirit carry over to Disney+, some of the stories might make it there, too. 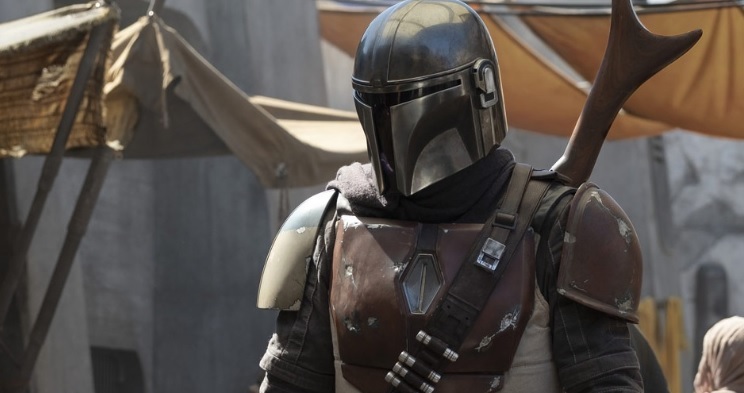 John Favreau’s The Mandalorian might be the most exciting piece of Star Wars currently in development. Set in an unexplored era, it promises a huge budget and an impressively diverse cast and crew. It is clearly also – though no one will admit this – a replacement for the long-rumored Boba Fett movie. The Fett film was always fatally flawed, because he is a character whose main attraction was his mystery and we now know everything about him. So Lucasfilm have made a smart decision: leave him digesting in the Sarlacc and come up with a new man of mystery in similar armor. I wouldn’t be at all surprised if they go full Clint Eastwood and never reveal his true name. Plus Dave Filoni is involved, which is always a cause for celebration. Then there’s the most direct link to the anthologies – Diego Luna returning to his role as Cassian Andor, a spinoff to a spinoff, picking a spinoff movie character and following his story. We are now in a world where television rivals film not just in monetary terms, but in star power. The likes of Amy Adams, Emma Stone and Meryl Streep are happy to commit to TV these days, so the show should have no trouble attracting Alan Tudyk, Jimmy Smits, Genevieve O’Reilly or the brilliant Ben Daniels. Not to mention Nikolaj Coster-Waldau as Agent Kallus (please). If the much-speculated Obi-Wan movie has been shelved, why not a mini-series? Ewan McGregor had great success on TV with Fargo, and a series set entirely on Tatooine would be (relatively) inexpensive to make. Then there’s a Solo sequel. Donald Glover and Emilia Clarke are known as TV stars more than movie stars, and a follow-up with Ehrenreich and Ray Park, produced by Howard and directed by his daughter, Mandalorian director Bryce Dallas Howard, doesn’t sound so outrageous. Felicity Jones has also recently said she would love to return to the role of Jyn on TV, and quite frankly Lucasfilm should move heaven and earth to make that happen. And what of Erin Kellyman as Enfys Nest, a character with such incredible potential? When the new movies were announced in 2012, I never would have expected that it would be the standalones that I would love and adore and go back to time and again, rather than the new trilogy. They’ve both been such a treat, such rich and worthy additions to the franchise, they made me feel like a kid watching the old movies for the first time again. Even if we don’t see any more, weep not for the past. There’s every sign Disney+ can pick up the baton, and with its potential for longer-form storytelling, dive even more deeply into those other areas of the galaxy, away from the traditional myth: the character pieces, the genre movies, the underworld. Thought we were in trouble there for a second, but it’s fine. We’re fine. As a long term Star Wars fan, saw it 1977, I agree that Rogue One is the best of the new productions. It is a story that I waited a long time for, a long time. Solo was totally unnecessary and although the performances of the cast was excellent didn’t need to be told. The same with a Boba Fett standalone and even an Obi Wan one . I am hoping that The Mandalorian is original and doesn’t just recover tropes already seen, and the Cassian series has heaps of potential. As to the Skywalker saga films, I enjoyed The Force Awakens but every time that I watch The last Jedi I become more ambivalent toward it. Here’s hoping that Episode IX can finish the story on a high note. I think having an Anthology film centered on a movie character largely defeats the point of having them, which is to explore corners of the galaxy and types of characters we’re not otherwise going to see.